Construction has finished on what is a new 2,800 sq. foot beach pavilion. This new building includes technology to meet sustainable or “green” building design criteria. This includes an energy efficient building shell to minimize heating loads, solar hot water panels, and a residential size 10 KW Bergey wind turbine on a 100 foot tower. 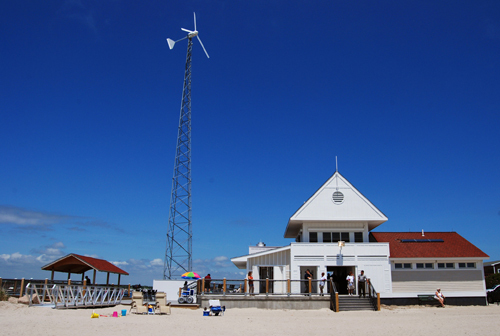 This project brings many other new features for beachgoers to enjoy, including a new boardwalk along the jetty with overlook platforms, a shade structure, decks, and the small residential scale wind turbine will provide electricity for the facility. The pavilion itself includes a concession stand, restrooms; solar hot water to supply coin operated hot showers, and a lifeguard tower. Parts of the building are heated to provide restrooms for the early spring and fall seasons. Parking: Electric vehicle charging station available for 4 hours max while enjoying the beach or other facility. The EV station does not guarantee a space on full capacity days and a parking fee is required when the beach is charging a fee. Regulation 29.5.1 - The Parking Lot at Salty Brine beach is for the use of State Beach patrons only. All vehicles using the lot must fit within the designated parking spaces and cannot protrude or obstruct any traffic within the parking lot.